As international companies leave Iran under U.S. pressure, the Iranian government is scrambling to salvage as much foreign investment as possible. The top leadership in Tehran believes the solution is to engage with Russia, China, and the “east” to replace the West’s hesitant commitment to the Iranian market. But this eastward approach is a pipe dream, and there is plenty of history to prove it. Iran is in desperate need of capital. Injections of cash are particularly urgent in Iran’s energy sector, the lifeline of its economy and—with billions of dollars in untapped oil and gas reserves—a key hope for its future as well. On paper, this might seem a huge investment opportunity for Russia, which has been forging oil and gas deals in the Middle East and North Africa for several years. But geopolitics suggest that the Kremlin may invest a lot less in Iran than it is capable of. Why? 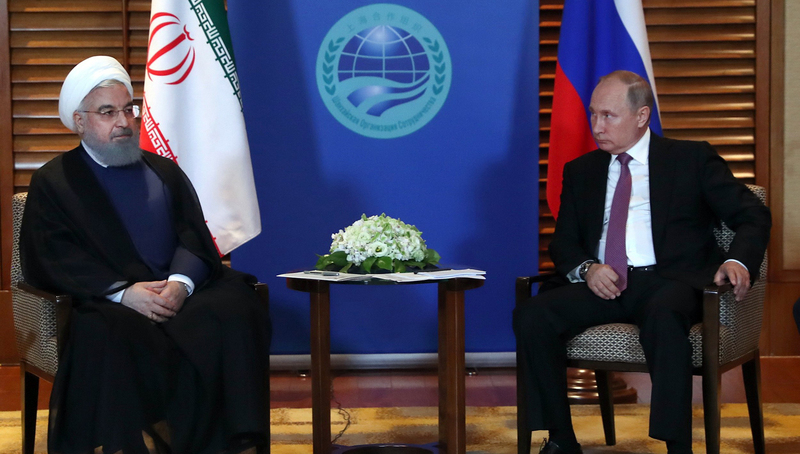 Moscow considers Tehran a rival both geopolitically, with both trying to increase their influence in the Middle East, and in the energy market, as both are seeking out gas markets in Southwest and East Asia. The bottom line is that cooperation between Russia and Iran in both the geopolitical and energy realms is a double-edged sword for Iran. Tehran needs Russia, but knows that Moscow will be only as helpful as it needs to be. One of Iranian president Hassan Rouhani’s major objectives when he met President Vladimir Putin on Jun. 9–10 at the Shanghai Cooperation Organization summit in China was to seek more Russian investment in his country. Putin, however, offered no ironclad commitments. In addition to appealing for Russian capital, Rouhani asked that Moscow do more to save the 2015 nuclear agreement that the U.S. pulled out of in May. Russia is also party to the agreement, as is the EU, many of whose leaders want to continue honoring it. Russia wants to preserve the agreement. But it worries that European countries will ultimately end up abandoning it out of fear that the U.S. will impose sanctions on European companies that do business with Iran. This would, of course, undermine Russia’s efforts to help Iran. Putin’s major objective at the meeting with Rouhani was to convince Iran to continue to abide by the OPEC+ oil volume-cut agreement led by Saudi Arabia and Russia. It has been a key factor in raising global oil prices, the mainstay of Russia’s economy. Moscow fears that President Donald Trump’s pullout from the Iran nuclear deal will prompt Iran to pump more oil. Tehran may feel a need to do this to counter the economic damage that Washington’s re-imposition of sanctions is likely to inflict on Iran. Middle Eastern geopolitical realities—including Russia and Iran’s desire to keep Syrian president Bashar Assad’s regime afloat—has created the conditions for a marriage of convenience between Moscow and Tehran. But marriages of convenience are inherently fragile, and Russia has already shown that it is a less than passionate suitor. Since 2012, Russia has signed 10 oil exploration and production agreements with Iran—more than any other country. Estimates of the deals’ value range from Russia’s figure of $20 billion to Iran’s $50 billion. But only one of the agreements has been binding. Russian energy companies would be only too happy to take advantage of practically nonexistent competition by investing heavily in Iran’s energy sector. However, they limited their investment even when the Iran nuclear agreement would have allowed them to do so without fear of U.S. and European reprisals. The main reasons for the foot-dragging have been geopolitical and financial constraints, with the financial constraints stemming from U.S. sanctions against Russia for seizing Crimea and supporting separatist rebels in eastern Ukraine. Russia also has yet to invest in a gas exploration or production project in Iran. In fact, the only gas-related project that Gazprom has invested in is a pipeline Iran is building to Pakistan. The implication is clear: Why should Russia help a major competitor at a time when competition for southwest Asian and Far Eastern gas markets is already heating up? As an example, Turkmenistan, which is already a formidable Russian energy rival, is trying to rev up the slow-moving construction of the Turkmenistan–Afghanistan–Pakistan–India pipeline. At the same time, Tehran is trying to forge closer energy ties with neighboring states, and exporting more natural gas appears to be the key objective. Before Rouhani assumed power in 2013, his current oil minister, Bijan Zangeneh, scoffed at some of the regional energy plans that Rouhani’s predecessor, Mahmoud Ahmadinejad, pursued after being inaugurated in 2005. Within a few weeks of Rouhani appointing him oil minister in August 2013, Zangeneh threatened to cancel the Ahmadinejad-inspired multibillion-dollar Peace Gas Pipeline to Pakistan. Ahmadinejad had hailed it as a groundbreaking step in Tehran’s integration into the regional energy network. But Zangeneh, a fierce Ahmadinejad critic, questioned its commercial viability. Zangeneh was also oil minister before Ahmadinejad’s presidency, and at the time he showed a preference for working with European energy companies. So it was no surprise after the Iranian nuclear deal was signed that he tried to convince European energy firms to return to Iran. When the U.S. pulled out of the nuclear deal, European energy companies, fearing U.S. sanctions, began leaving Iran again. Zangeneh had to do an about-face on the pipeline he had jeered. One of Iran’s main goals in pursuing energy cooperation with its neighbors has been to encourage broader economic integration—a path it sees as strengthening political relations as well. Since Washington pulled out of the Iran nuclear deal, this priority has become more important than ever. The Kremlin sees Iran as an integral component of its energy security strategy. Moscow’s influence over Tehran’s energy policies gives it added leverage in global commodity markets. This is particularly true of Iran’s commitment to the OPEC deal. At the moment, Iran is benefiting from the higher oil prices the deal has generated, so it continues to support it. But Tehran is disappointed with OPEC and Moscow’s expected decision to increase oil volumes to offset a drop in production in politically chaotic Venezuela and to meet an anticipated surge in Chinese demand. Encouraged by the oil price rises that the OPEC+ deal has generated, Russia is determined to use the Gas Exporting Countries Forum (GECF) to keep gas prices up. At the moment, forum members represent 66 percent of global gas production, so it does not have the same ability to affect gas prices that OPEC does to oil prices. But countries continue to join the group, meaning it has potential. Interestingly, the GECF was founded in Tehran, is headquartered in Qatar’s capital of Doha, and is chaired by Russia. As with OPEC, the U.S. is not a member. Russia is likely to try to impose conditions on Iran for its continued geopolitical and energy cooperation. So is China, which wants Iran to help it break the dollar’s hammerlock on energy trading. Iran is a tough negotiator, however, and it will not be easy for either Moscow or Beijing to impose their will on Tehran. Russia, which is Europe’s largest oil supplier, has no interest in strengthening Iran’s energy industry to the point that it becomes a formidable competitor for the European market. In fact, it would just as soon see Iran’s export capacity decline. Russian energy companies are likely to be interested in investing in non-oil projects in Iran—like nuclear deals—or engaging in oil swap agreements that generate sales in markets that Russia has yet to conquer. Meanwhile, Russian companies, particularly Rosneft, are likely to seize on any Iranian energy export decreases to bolster their sales in China and India. China has already taken its first steps toward having the yuan replace the dollar as the world’s oil trading currency. Iran is one of its largest oil suppliers. If Iran agrees to yuan transactions, it would boost the Chinese currency’s liquidity in the global market. In terms of its short-term energy prospects, Iran may have to rely a lot more than it would like on the whims of Russia, one of the strongest competitors in the energy market, and the largest importer of its oil, China.